After having signed 39 numbers of it, Minghetti leaves the direction of Hamlet to found Personae, Eni magazine of which he takes on the lead. 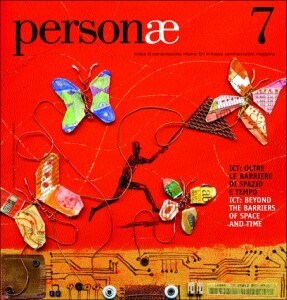 With Personae he analyses more in detail the implementation of those editing criteria inspired by metadisciplinarity, multiculturalism, ethic reflection integrated by original aesthetic research; the graphic aspect of each number, in fact, is cared by a different internationally known artist. 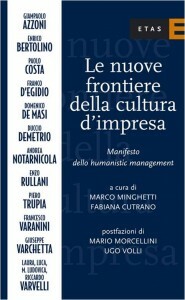 In 2004, Marco Minghetti, supported by Fabiana Cutrano, invited fifteen important representatives of managerial, academic and artistic world (from Domenico De Masi to Enzo Rullani, beside the main actors of the Hamlet experience) to reflect on the frontiers of business culture that Hamlet has designed and Personae is exploring in the context of the major Italian multinational business, ENI. The result of it is the Manifesto dello humanistic management (Humanistic Management Manifesto) (ETAS), founded on the great tradition of European Humanism. Its main features can be seen in the accurate combination of rationality and emotion, in the balance of individual moral and collective ethic, in everyone’s care towards his/her own self development and towards the others and, above all, in its metadisciplinarity. The main tool it uses, in fact, is its being open towards fields that business has always considered as foreign, such as philosophy, poetry, cinema, theatre, but also to the new frontiers opened by information and communication technology, by multimedia networking, by business television. From 2005, the more and more detailed study of the themes regarding humanistic management is took forward through special structured initiatives: special surveys and inquiries carried out for the magazines L’Impresa, directed by Francesco Bogliari, and Persone e conoscenze by Francesco Varanini; the first primo Simposio sullo humanistic management (Symposium on Humanistic Management) organized at the Università La Sapienza in Rome; the opening, thanks to Paolo Costa, of a devoted web site; the inclusion in the Etas catalogue of a section entitled “Humanistic Management”, collecting books that took inspiration by its principles; seminars and meetings on the issued at the Universities of Milan, Bergamo and Rome.